Home / Blog / Our Bus Advocacy Grants are being put to work! Our Bus Advocacy Grants are being put to work! In 2017, Active Trans and our partners from the Back on the Bus Coalition published the Back on the Bus report. This report found that bus ridership in the city was dropping and that the way to increase bus ridership was to focus on improving bus speed and reliability. To continue this work, Active Trans decided to give grants to four community organizations interested in advocating for these policies in their communities. Our Bus Advocacy Community Partners for this project are Westside Health Authority, Six Corners Association, Northwest Side Housing Center and Pilsen Alliance. Poor bus service affects everyone in the city, but especially minority and lower income residents. Poor bus service can cost those who have no other options their jobs or missed health appointments. These community organizations are currently planning surveys, gathering personal accounts and hosting community meetings to find out which bus routes and intersections are in the most need of these improvements. If you have a story about what poor bus service has cost you and are open to sharing this story, please contact julia@activetrans.org. After the community organizations have decided on specific intersections and bus routes that need these improvements, press conferences and advocacy activities will be held. Additionally, in early September Active Trans will be publishing “Bus Service Report Cards” for all 50 Chicago wards and a few major bus routes in the city. These report cards will analyze the speed and reliability of the bus routes that go through each ward and will grade the ward based on average speed, bus bunching and average wait time. These report cards will be available on the Active Trans website in an easily printable form. These two projects are especially exciting after Mayor Emanuel announced a plan to expand the city’s transit-oriented development (TOD) policy to include high-ridership, high-frequency bus routes. TOD will not be successful without much-needed upgrades in bus service. 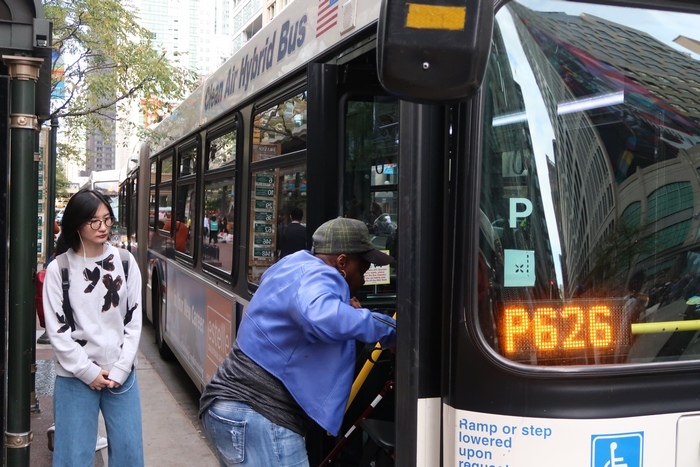 To increase bus ridership in Chicago, the buses need to be fast, frequent and reliable, which is a goal that can be met if the city implements prepaid boarding, transit signal priority for buses and more dedicated bus lanes. Active Trans hopes that the Bus Advocacy Grants for Communities and the Bus Service Report Cards will be a step towards improving bus service equity within the city of Chicago and will be considered when the mayor expands TOD policy to high-ridership, high frequency bus routes. This blog post was written by Active Trans Bus Advocacy Intern Esther Ramsay.